Our father doesn’t necessarily mean our ancestors; it means our fathers in faith, starting from Abel to date. This is not a statement of someone looking around for God who is missing. This is, however, a statement of someone calling on God to do something. A statement of someone who needs concrete evidence and proof that God is for them and that He is without any doubt working on their behalf. 1 Corinthians 10:13 – There hath no temptation taken you but such as is common to man: but God is faithful, who will not suffer you to be tempted above that ye are able; but will with the temptation also make a way to escape, that ye may be able to bear it. I’m not sure how many of us are in that category this morning? If you happen to be among, may God presence in your life become more vivid more than ever before. Judges 6:11-14 – And there came an angel of the Lord, and sat under an oak which was in Ophrah, that pertained unto Joash the Abiezrite: and his son Gideon threshed wheat by the winepress, to hide it from the Midianites. And the angel of the Lord appeared unto him, and said unto him, The Lord is with thee, thou mighty man of valour. And Gideon said unto him, Oh my Lord, if the Lord be with us, why then is all this befallen us? and where be all his miracles which our fathers told us of, saying, Did not the Lord bring us up from Egypt? but now the Lord hath forsaken us, and delivered us into the hands of the Midianites. And the Lord looked upon him, and said, Go in this thy might, and thou shalt save Israel from the hand of the Midianites: have not I sent thee? The children of Israel had sinned against God by worshipping other gods, so God allowed the Midianites to torment them. They would labour to plant all kinds of crops; the Midianites would then invade the land during their season of harvest and take away their crop produce. – May you not plant only for another to harvest in Jesus name. God sent a prophet to them to make them understand why they were suffering; so the people repented and cried to God for help. It was for this reason that Gideon was threshing his wheat harvest in their winepress. So the enemy would not locate where his grains were kept. Hearing the words of the angel, Gideon express his doubt of how that could be the case. How could God have been with him or with them? Considering what they were passing through. It doesn’t seem so. And if truly God was with him, where are all the wonders that God performed during their father’s time, when God demonstrated His presence among them. Gideon had read books and had heard from men the testimony of what God had done before. He could not fathom how that same God would have been with them, and they would still be suffering from the Midianites. – There is someone here, you are in doubt that the Lord is with you because of certain circumstances around you. I’m asked to reassure you “The Lord is with thee”. Sometimes it does appear to us that God was more active in the ancient times more than now. The Bible, however, told us that is not the case. Malachi 3:6 – For I am the Lord, I change not; therefore ye sons of Jacob are not consumed. There are times we read certain stories in the bible that sounds like fiction. Yet they were true. One may be prone to ask the question “where is the God of that time”? This was the situation that Gideon found himself. He was asking the angel if God was truly with them, where are the kind of miracles God performed when their fathers were led out of Egypt? Gideon was of the opinion that if it’s the same God that did all those for their fathers is the same God that the angel said was with them; the Midianites should not be able to molest them. – Just like someone seated here, when you have read or heard the miracles that God has done, not that you didn’t believe God did it, your concern is “Is He really involved in your own case? God is asking me to tell you once more “The Lord is with you, and that you are actually a mighty man/woman of valour”. We are men and women of faith. One attribute of faith is that it does grow. Mostly by going through trials and listening to other people’s testimonies. There can be no testimony without a test. The just shall live by faith, but that faith has to be tried and tested, to continue as been just. God uses the trials we face to promote us first in the spiritual realm, and then in the physical. He also uses it to glorify His name; to shut the mouth of the Accuser of the brethren and also as a faith booster for others that will later pass through the same thing. 2 Corinthians 12:7-10 – And lest I should be exalted above measure through the abundance of the revelations, there was given to me a thorn in the flesh, the messenger of Satan to buffet me, lest I should be exalted above measure. For this thing I besought the Lord thrice, that it might depart from me. And he said unto me, My grace is sufficient for thee: for my strength is made perfect in weakness. Most gladly therefore will I rather glory in my infirmities, that the power of Christ may rest upon me. Therefore I take pleasure in infirmities, in reproaches, in necessities, in persecutions, in distresses for Christ’s sake: for when I am weak, then am I strong. One of the greatest weapons the enemy uses against us is our feelings. What we feel and how we feel. Though feelings are natural and therefore real; there is, however, another aspect of our lives that is more real than the natural; it is the realm of the spirit. This aspect is controlled by our faith and not by our feelings. To effect the desired changes in what we feel or in our natural world, we have to first address those things in the supernatural and then we can see their manifestation in the physical. Even God commences something first in the spiritual before making it happen in the physical. Genesis 1:26-27 – And God said; Let us make man in our image, after our likeness: and let them have dominion over the fish of the sea, and over the fowl of the air, and over the cattle, and over all the earth, and over every creeping thing that creepeth upon the earth. So God created man in his own image, in the image of God created he him; male and female created he them. God has promised us His children through His word that He will never leave nor forsake us. Circumstances may not look so, but the truth is God is always with His children. Isaiah 43:1-2 – But now thus saith the Lord that created thee, O Jacob, and he that formed thee, O Israel, Fear not: for I have redeemed thee, I have called thee by thy name; thou art mine. When thou passest through the waters, I will be with thee; and through the rivers, they shall not overflow thee: when thou walkest through the fire, thou shalt not be burned; neither shall the flame kindle upon thee. The two sentences the angel made to Gideon did not make sense to him. – The Lord is with thee. – Though a mighty man of valour. Just like at times we too ask God why? Gideon was asking the angel why they were going through difficult stuff. God had however searched through all Israel and found out that on this occasion, He would use Gideon as the instrument of deliverance. – I heard that God is preparing someone here for an exploit that will glorify God and shock mankind. Note that asking God why one is going through a particular situation with a sincere heart for an answer from Him is not a sin. What is a sin is when we murmur against Him; or when we argued and rebelled against His will. When Jesus was on the cross, He asked His Father why He was forsaken. His Father would have told Him, He could not behold iniquity. So it’s okay to ask God the father, the why, where, what and when, as long as it is from a sincere heart and made in a humble manner. Note that Gideon did not say to the angel “keep quiet, shut up, hold it” or any rude word. He actually started by saying “Please my lord, please my master. Where is the proof or evidence of what you said”? It is interesting that the angel also did not say “shut up” to Gideon, because his questions were sincere; because they were truly suffering and because he needed to be convinced. While many times we are asking God why and what; God is already counting on us to save the day. Gideon had been prepared. You shall be prepared for victory in Jesus name. God was about to showcase Gideon as an extraordinary being in history, meanwhile, he was still seeing himself as a deprived, poor and insignificant fellow in Israel. You may think that God is not aware of your situation, but He does. He already has a plan worked out for you. While Gideon was still thinking of how they would escape from the host of Midian; God already knew that it would be 300 unarmed men that would do the deliverance job. It must be shocking to Gideon that what he thought he did not have is what God saw in him, and asked him to proceed with. – Proceed with this thy might. In what sense? Gideon would have looked around and asked. Who is that? Which might are we talking about? When the angel said “Thou mighty man of valour”, the likes of Joshua and Caleb would have come to Gideon’s mind. But he didn’t see himself as one. He didn’t think he had the zeal, courage and strength to deliver Israel. But God saw that it in him. The question we will need to ask God this morning, therefore, is “So, if this is not the real me, Father, who am I really? Tell me. Show me. Make me. Announce me. – Living in right standing with God. The Israelites had to repent. – Willingness to obey His instructions regardless of the prevailing circumstances. Asked for proofs, but he was willing. – Humility. Not relying on one’s strength. Ack your inadequacies before God. Romans 8:30 – Moreover whom he did predestinate, them he also called: and whom he called, them he also justified: and whom he justified, them he also glorified. – Father, glorify me in what you have predestined me for. Proverbs 19:21 – There are many devices in a man’s heart; nevertheless the counsel of the Lord, that shall stand. – Father, who am I really? Tell me. Show me. Make me. Announce me. Exodus 33:14 – And he said, My presence shall go with thee, and I will give thee rest. – Father, in each of the seasons of my life; let me experience your tangible presence. 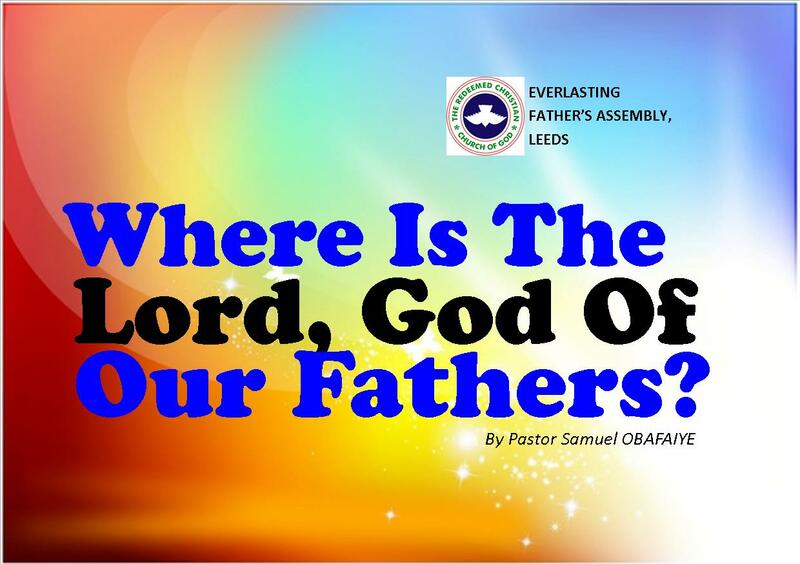 The sermon, Where Is The Lord, God Of Our Fathers? by Pastor Samuel Obafaiye, was delivered on April 29, 2018.